Sony Online Entertainment has announced they will now start accepting beta sign up applications to their upcoming MMO, DC Universe Online, which is set to launch on PlayStation 3 and PC in November. 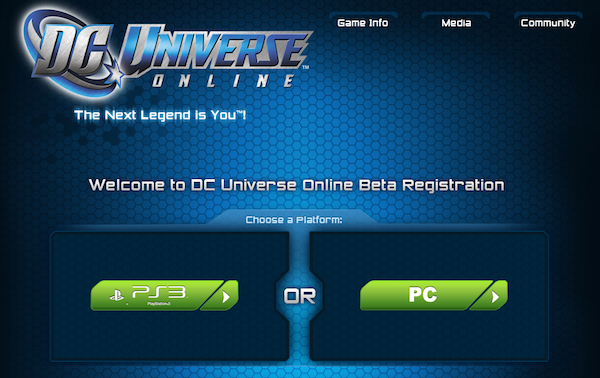 You can sign up for the DC Universe Online beta here. Sony Online Entertainment also announcement that a limited edition of the title for the PC that includes a limited edition Art of DC Universe Online book, Batman statue designed by Jim Lee, and DC Universe Online: Legends Issue #0, written by Tony Bedard, and illustrated by Livio Ramondelli, Oliver Nome, and Michael Lopez. Let us and the rest of the BlogsDNA community know if you get in! I am in thanks to a beta code from SOE Fan Fair. No word on when it starts. All it said is I will get an email when to begin.